So I arrived yesterday at 7 am at Ko Tao. I took a taxi (pick-up truck) until Sairee beach. This is a long beach where most accommodation are, also close to the village. I have found a cheap and decent room in a bungalow on the beach, and I was quite delighted with it. I went to explore the surroundings and have a feel for the prices. After breakfast I looked at diving options. I was thinking is expensive and it will hurt my budget (and I already spent more than I was supposed). There are many diving shops on the island, and prices are about the same. Still, I have found one shop that will give one free dive for every 3 dives, so I signed up for it. An hour later I was on the boat, ready to dive. I have noticed that the colour of the water was unbelievable turquoise. I haven't seen this beautiful color anywhere else so far. I had a little bit of anxiety, because it was about 6 years since I last dove. Once that I got in the water, it all came back, I felt comfortable and went for it. 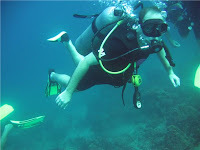 The first dive was in the Mango Bay, close to the shore. It was a shallow dive with some corals and some fishes. The visibility was great. I wasn't very impressed, but it was OK. The second dive was at the White Rock, a bit further away. This was better, more marine life, and for the first time I saw stingrays. 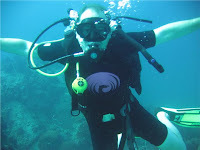 I wasn't sure I will do any diving, but I am so glad I did it. In the evening I walked around.Unfortunately, leaving right on the beach in the middle of everything has its downsides. Close by, some kids had a party all night long, so I barely slept. I went for the morning dives (7am), and I was so tired, I had to get a coffee on the bot to keep me awake (I very rarely drink coffee). 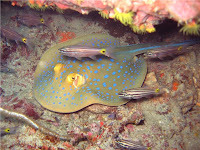 The first dive was at Southwest Pinnacle. 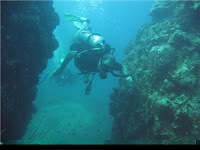 I was deeper, and a lot of marine life, I enjoyed it. I saw some huge fishes. The second dive was at the Shark Island, and it was probably the best of all. Among other things, saw a turtle. After diving, i went back to the bungalow ans slept few hours. In the evening I walked on the beach and to the pier. Although I've been already on few islands, I wasn't bored with it. It may be the same in some regards, but in others is different. This island has something picturesque. That's what I'm thinking too; I could go like this the rest of my life. A big thank you to my buddy Mats Persson who happened to have an underwater camere and was kind enough to take some pictures of me too. Too bad you didn't come the next day, we saw a turtle!